Printing errors are very interesting because they can provide insight into the manufacturing process of the label side of Target CDs. 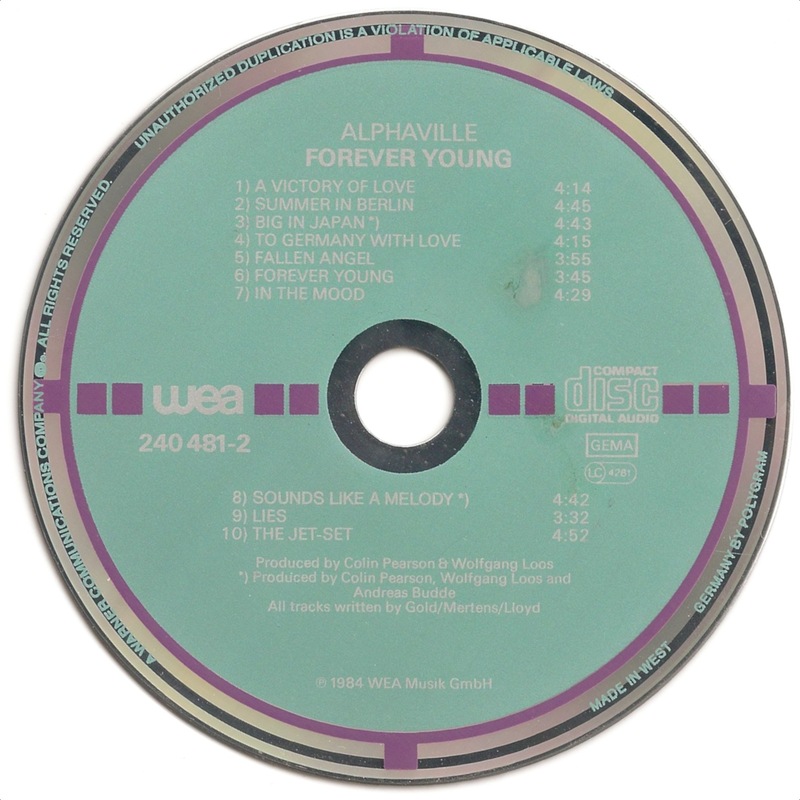 The disc that is featured here, Alphaville's classic album Forever Young, shows a mis- alignment between the purple target squares and the silver lettering on the one hand and the green perimeter text on the other hand. Examining the disc more closely reveals that the production of the label side must have been carried out in at least four different steps. First the green coating was applied onto the disc's surface, leaving empty spaces (knockouts) for the horizontal purple squares. Traces of these knockouts can still be seen, especially above the two utmost right target squares. In a second step the purple target squares, together with the purple ring, were put down. Then the silver lettering was printed over the green surface. It is possible but unlikely that steps two and three were executed in reverse order. Finally the green perimeter text was put down. And here a misalignment occurred, whereby the text in both the northern and southern hemisphere is shifted dramatically. It is obvious that the spaces between RESERVED and UNAUTHORIZED and between WEST and GERMANY should have been filled with the top and bottom target square respectively. The perimeter text must also have been put down after the target squares, as is evidenced by the fact that the two squares at 9 and 12 o'clock are overprinted with the words COMPANY and VIOLATION. Another interesting printing error came to my attention some time ago. 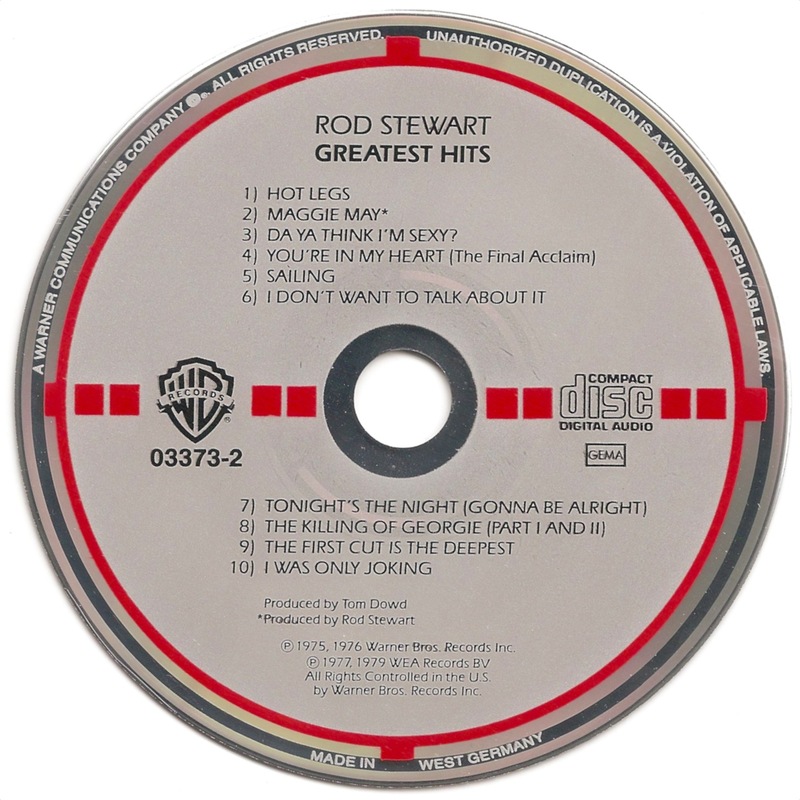 It is Rod Stewart's Greatest Hits, whereby the outer targets, especially those at 6, 9 and 12 o'clock, are clipped and do not cover the outer miror band. I don't know what could have caused this clipping, possibly the disc was not fully exposed to the offset screen when the target squares were put down on it.